Description: Another Plant Scherer reroute rounds the curve into Reynolds, GA. Description: NS 735 is all stretched out on the flats west of Butler, GA. Description: Three engines and 122 cars all in one frame!!! Description: Eastbound crossing the West channel. Description: 2 GE's lead a loaded coal drag up Bozeman pass. Mid train is MRL 4312 4315 4314 with DPU's BNSF 8821 and 5890 on the rear. Description: A loaded coal train is rolling downhill into Bozeman, MT after assaulting Bozeman pass. Description: Another sunny day brings another boring set of BNSF GEs' on an empty Powder River train headed back to the basin. Description: Westbound train of OGEX empties near Whitman. Description: Some BNSF power resting in the yard. 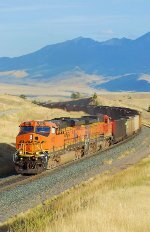 Title: BNSF 9251 leads a load of coal sb. Title: BNSF 9855 leads a oil can Sb. Description: leading a Oil load Sb out of elsberry after meeting a 5 unit empty coal train. Description: BNSF 9855, 4400, & 5712 were leading this empty oil can North but due to a derailment they have been ordered to turn around and head back South to St. Louis and then detour over the Cuba Sub. Side note: The buffer car is not your normal buffer car, since the rear of this oil can did not have one they used the last car of the freight from a derailment to act as the buffer car. Title: BNSF 7091 and More good power sitting in the yard this Morning!!! Description: good power finally shows up as i half to leave town.